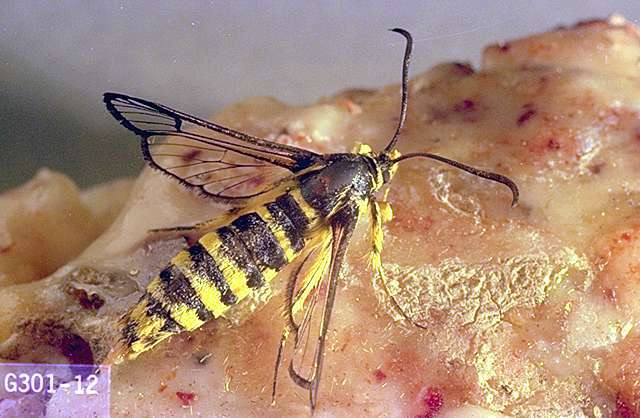 Pest description and damage These adult are clearwing moths with either yellow and black markings (sequoia) or orange and black markings (Douglas-fir) resembling yellow-jacket wasps. 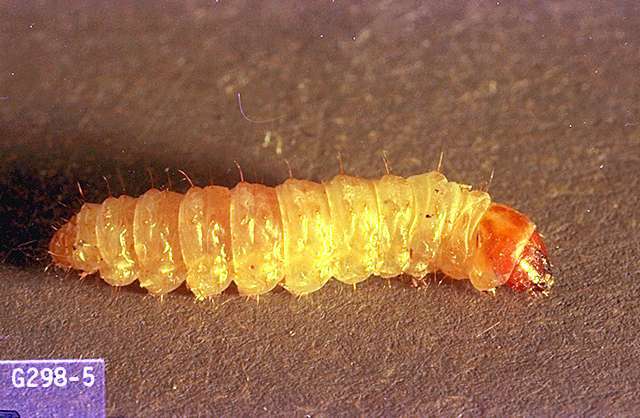 The larvae are about 1 inch long, yellowish, with a reddish-brown head (sequoia) or naked ivory-white with brown marks on the thorax (Douglas-fir). The larvae of the sequoia pitch moth feed by boring into branches or trunks. At the point where the larva enters the wood, small to large masses of creamy yellow to pinkish pitch accumulate. The larva feeds locally underneath the pitch mass. 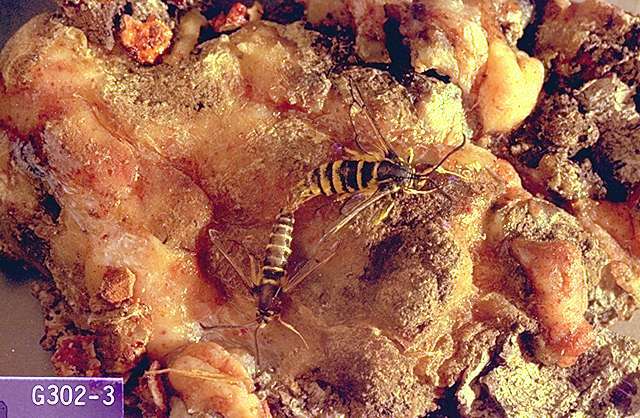 This pest causes mainly aesthetic damage because of the dripping pitch and pitch masses. These moths have a wide range of pine tree hosts, but the sequoia pitch moth does not attack sequoia, the coast redwood. Biology and life history Eggs are laid on the bark of host trees. The larvae bore into the inner bark and establish a feeding site. The feeding site can be distinguished easily by the large accumulation of pitch and frass on the exterior of the bark. Pupation takes place within this mass. When adults emerge, the pupae wriggle to the surface and protrude from the pitch mass. The adult moths fly in summer. About half the population completes its life cycle in 1 year; the other half requires 2 years. Pest monitoring Pheromone traps are available to time adult activity and entrap males. Healthy trees are not commonly attacked. Infestations often are associated with pruning wounds or mechanical damage to the tree. Trees which are wounded in the spring and summer when adult moths are flying are far more likely to be attacked than those pruned or injured in the fall and winter. The moths also may be attracted to trees undergoing stresses associated with drought or saturated soil. Remove pitch masses and caterpillars by hand before pupal cases protrude.